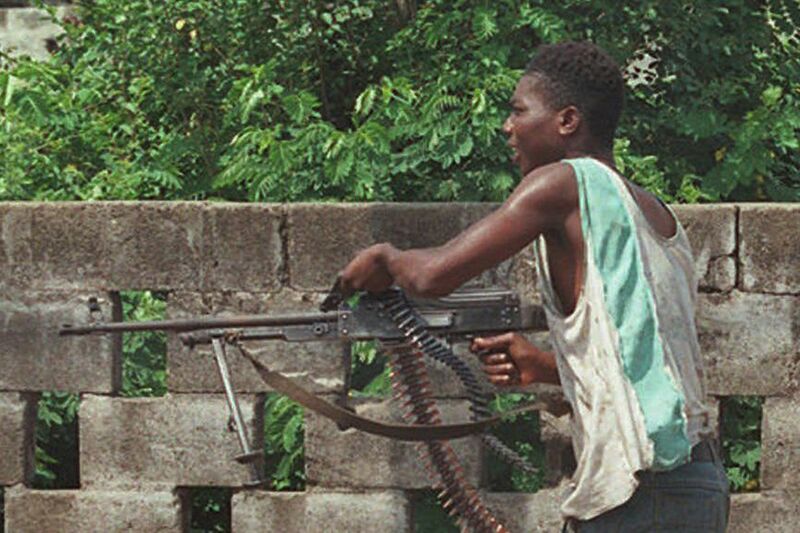 Liberian factional fighters loyal to Charles Taylor's National Patriotic Front of Liberia (NPFL) fire a high caliber machine guns at rival fighters in downtown Monrovia in 1996. Up for sale were hundreds of military-grade automatic weapons, thousands of rounds of ammunition, and surface-to-air missiles — all purportedly stolen while en route to American soldiers fighting in Iraq and Kuwait. The prospective buyer – Thomas Woewiyu, a top lieutenant to Liberian warlord Charles Taylor – was willing to pay top dollar for the firepower that would help his rebel army seize control of his West African nation's government. Little did he know U.S. authorities were recording him the whole time. As federal prosecutors in Philadelphia wrapped up their case this week against Woewiyu – the Collingdale, Delaware County, man on trial for allegedly lying to U.S. immigration authorities about his role in Liberia's first protracted and bloody civil war, in the 1990s – they shifted focus toward examining the part he played in arming Taylor's forces throughout the conflict. In 1993, Woewiyu – then serving as Taylor's defense minister and chief spokesman — was caught up in an undercover sting operation conducted by U.S. customs officials hoping to snare a Florida arms smuggler. As the lead agent on that case, Gary Lang, described video footage recorded during that probe, he offered jurors something new to consider: images and audio of Woewiyu examining what he allegedly believed to be stolen military hardware and negotiating how he could sneak it out of the United States. "Yeah, medical supplies. They are all over the place," Woewiyu jokingly said during one recorded conversation played in court this week – a reference to his plan to smuggle the illicit firearms into Liberia by disguising them as humanitarian aid. The $2.3 million deal was never consummated and Woewiyu was not charged, Lang said. But the images of the blithe commando, then 47, seen on the recordings portrayed Woewiyu in a far different light than how jurors have seen him in throughout much of the trial. Although other government witnesses have described countless atrocities committed by Taylor's fighting force – the National Patriotic Front of Liberia (NPFL) — including ethnically targeted killings, torture, and the conscription of child soldiers, Woewiyu, now 72, has reacted to much of it with an air of unconcerned aplomb. Besuited and often chewing gum while seated next to his lawyers at the defense table, he rarely has sought to challenge the accounts of NPFL brutality described by the wartime victims testifying against him. Thomas Woewiyu of Collingdale, Delaware County, at the federal courthouse in Philadelphia during the third week of his immigration fraud trial tied to lies he allegedly told about his role during Liberia’s first civil war the in ’90s. Instead, Woewiyu has focused on the core issue in his case – whether he lied about his association with Taylor when applying for U.S. citizenship starting in 2006. He has maintained that he was always up front with American authorities about his role and that he was unaware of the NPFL's worst excesses during a war that left more than 200,000 civilians dead between 1989 and 1997. But Peggy Lin Chang, the U.S. Citizenship and Immigration Services officer who rejected Woewiyu's citizenship application in 2010, cited his involvement in the 1993 arms deal as just one of the reasons for her decision. "I felt he wasn't forthcoming until we told him we knew" about his NPFL ties, she told jurors Wednesday. Prosecutors also have raised concerns about the circumstances under which Woewiyu entered the U.S. on a student visa in 1969, purportedly to attend flight school in Florida. One audio recording from Lang's investigation, played for jurors this week, featured Woewiyu admitting that he had never actually enrolled. Yet he still managed to obtain legal permanent U.S. residency in the '70s. Starting Thursday, though, Woewiyu began a last push to fight back. With the conclusion of the government's case, his lawyers presented testimony from a short string of witnesses — including four of his children, all of whom described their father as an honest and law-abiding man. Woewiyu's former immigration attorney, Raymond Basso, also testified, echoing a claim the defense has been making from the start: that Woewiyu's failure to note his status as a founding member of the NPFL was a mistake made in haste, not a lie. When prosecutors pointed out that it took two subsequent requests for more information before Woewiyu acknowledged his association with Taylor, Basso said he knew about his client's involvement with the rebel group but did not know that its goal was to overthrow the Liberian government. Throughout the trial, the defense has stressed that in Woewiyu's mind, he, Taylor, and others were fighting in the '90s to wrest control of their country from an oppressive and corrupt dictator — then-President Samuel Doe, who seized power in a bloody 1980 coup by executing his predecessor and many cabinet officials. And they needed the weaponry to do it. To that end, Woewiyu negotiated a series of deals to arm and train the rebels, starting in 1988 with an agreement he brokered with Libyan strongman Moammar Gadhafi to drill NPFL soldiers at a military facility in Tripoli. Later, Woewiyu obtained $75,000 to buy firearms for Taylor's army – a fact he admitted as part of a 2004 investigation into the dealings of Dutch arms trafficker Gus Kouwenhoven, who was convicted last year by a court in the Netherlands for his role in fueling the Liberian conflict. And as the war dragged on into the early '90s, Woewiyu's need to match the firepower of Taylor's enemies drove him into the arms of Lang, the undercover U.S. customs agent. At the time of their first meeting in 1993, Lang testified, he had been working in secret for five years in a Miami storefront, where he posed as a dealer in stolen military-grade weaponry. And it was one of his probe's actual targets, a Florida smuggler named Eugene Cox, who made the introduction. "These guys are revolutionaries," Cox said of Taylor and Woewiyu in an early meeting with Lang caught on hidden-camera video. "They don't have the expertise to do this. They have to come to people like us to do it." Lang insinuated that the weapons had been diverted from a shipment meant to support American soldiers then fighting in Operation Desert Storm in the Middle East. Videos shown to jurors this week showed Cox examining M16s, AK-47s, and grenade launchers in Lang's fake warehouse as strains of Stevie Wonder's "Isn't She Lovely" played from tinny radio speakers nearby. Woewiyu seemed eager to purchase Lang's cache, explaining that Taylor's forces were outgunned and in need of surface-to-air missiles capable of shooting down the jets of West African peacekeepers sent to restore order in Liberia. In exchange, Cox urged Lang to set up a dummy corporation into which Woewiyu and Taylor could divert profits from the exploitation of some of Liberia's mineral wealth once the NPFL had seized control. But when the time came to finalize the transaction, Lang testified, Woewiyu showed up with only a $2.3 million promissory note signed by Taylor and several ministers in his shadow government. The deal fell apart soon after. Much like Taylor's pledge to lead a democratic uprising on behalf of all Liberians, that payment remained an empty promise. The trial will resume next week, as lawyers for both sides present their closing arguments to the jury.